Platinum Hydrowhey is the fastest, purest, most advanced whey protein Optimum's ever developed. In a word: excellence. What else would you expect from the most proven protein brand? By hydrolyzing the protein in this premium formula we've created our fastest-acting whey protein yet. Hydrolyzing breaks larger proteins down into smaller pieces that are able to get into your system rapidly, enabling your muscles to start rebuilding quickly. For added effectiveness, we've also enhanced this revolutionary formula with digestive enzymes and micronized branched chain amino acids (BCAAs). In addition to being fast, Platinum Hydrowhey is also ultra-pure. That's because it's made entirely with hydrolyzed whey protein isolates. So there's no excess fat, cholesterol, or lactose to slow down your progress. By combining the absolute finest ingredients with a series of highly specialized processing techniques Optimum Nutrition (ON) has created its most valuable muscle building protein yet. Everything about Platinum HydrowheyÂ® was designed with an uncompromising attitude toward performance - both in the gym and your shaker cup. Platinum HydrowheyÂ® is protein in its purest expression. It's made only with hydrolyzed whey proteins that have been isolated to remove the excess lactose, cholesterol, carbohydrates, and fat. The result is a product that's ultra-pure, quickly digested, and packed with muscle building and replenishing amino acids. 100% of the proteins in Platinum HydrowheyÂ® are hydrolyzed to varying degrees. Hydrolyzing is a process through which intact proteins are strategically broken down into smaller fragments, called peptides, for faster delivery and easier utilization by your body. ON's exclusive combination of mild, moderate, and ultra-hydrolyzed proteins provides di-, tri-, and oligo-peptides while retaining select microfractions naturally found in whey. If this is too much technical talk, all that you really need to understand is that Platinum HydrowheyÂ® is ideal first thing in the morning, before workouts, and immediately after workouts when your hard-working muscles benefit most from a fast-acting protein. All proteins are made up of amino acids, but not all amino acids are of equal importance. The three branched chain amino acids (BCAAs) are particularly beneficial for athletes because they assist with new muscle synthesis and protect the muscle that you already have against breakdown. That's why ON enhanced every serving of Platinum HydrowheyÂ® with added BCAAs for a total of over 8,800 mg per scoop. The only way to reap the results of Platinum HydrowheyÂ® is to drink it. So from the outset, ON benchmarked the taste and mixibility against the best protein powders on the market. Regardless of whether you choose Turbo Chocolate or Velocity Vanilla, Platinum HydrowheyÂ® tastes as great as it works and dissolves easily in water, milk, or juice. Try using complementary nutrients and mixing in other foods and performance supplements to boost the functionality of your Platinum HydrowheyÂ® shakes. Morning: Platinum HydrowheyÂ® shake + Opti-Men. Why? Your body needs vitamins and minerals to effectively use protein, carbohydrate, and fat. Before Workouts: Platinum HydrowheyÂ® mixed with skim milk + Micronized Creatine powder. Why? Hundreds of clinical studies support creatine monohydrate's ability to boost strength, size, and power. Combining creatine with protein and carbohydrate increases muscle uptake. After Workouts: Platinum HydrowheyÂ® mixed with iced coffee + Glycomaize + Glutamine Powder. Why? At no other time throughout the day are your muscles as receptive to nutrients as they are post-workout. Fast-acting proteins, free form amino acids, and quickly digested carbohydrates provide building blocks for rebuilding and replenishment. Recent research also suggests that a shot of caffeine (in this case, from the iced coffee) may also help facilitate greater glycogen resynthesis, which means you'll be ready to go for your next workout. Before Bed: Gold Standard 100% Casein + Instantized BCAA 5000 powder. Why? Rapid digestion is beneficial during the day while you are active. But, slower is better at night. Casein proteins and BCAAs help protect and preserve your hard earned muscle tissue throughout the night while you sleep. 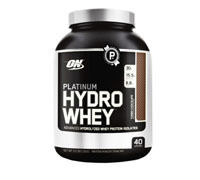 Directions: Platinum HydrowheyÂ® is INSTANTIZED, so it always mixes up easily and completely. Simply add 1 scoop of Platinum HydrowheyÂ® to a blender, shaker cup, or glass filled with 12 ounces of cold water, milk, or juice and blend, shake, or stir for 20-30 seconds or until powder is dissolved. TIP: Adjust the intensity of your Platinum HydrowheyÂ® shake by varying the amount of liquid you use to prepare it. For a slightly thicker consistency with a bolder flavor, mix each scoop with 10 ounces of water. For a milder tasting less sweet shake, use 14-16 ounces of liquid per scoop.